The Hongzhou school (Chinese: 洪州宗; pinyin: Hóngzhōu Zōng) was a Chinese school of Chán of the Tang period, which started with Mazu Daoyi (709–788). It became the archetypal expression of Zen during the Song Dynasty. ...other schools were arising in outlying areas controlled by warlords. These are the forerunners of the Chan we know today. Their origins are obscure; the power of Shen-hui's preaching is shown by the fact that they all trace themselves to Hui-neng. Traditionally, Mazu Daoyi (709–788) is depicted as a successor in the lineage of Hui-neng, since his teacher Nanyue Huairang is regarded as a student and successor of Huineng. This connection between Hui-neng and Nanyue Huairang is doubtfull, being the product of later rewritings of Chán-history to place Mazu in the traditional lineages. Mazu settled at Kung-kung Mountain by Nankang, southern Kiangsi province, where he founded a monastery and gathered scores of disciples. During periods of ascetic practice the monks would sleep on the same straw mat on which they sat in meditation and on which, according to defined ritual, they took their meals. Both the lifestyle Pai-chang spelled out as well as the architectural form of his monastery became models for later Zen monasteries". ...critical of the Hung-chou style. For him, this excessively rural school of Buddhism lacked the comprehensive vision that he found in Ho-tse Zen and in the Hua-yen philosophical school of Buddhism. Péi-hsiu, however, became interested, and in 842 invited huangbo to the Lung-hsing Monastery. Linji Yìxuán ((died 866 CE)) became the archetypal representant of Chán, as expressed in his recorded sayings. He was a student of Huangbo, who also figures in the Recorded sayings of Linj. According to these records, Linji attained kensho while discussing Huángbò's teaching with the reclusive monk Dàyú (大愚). Linji then returned to Huángbò to continue his training. In 851 CE, Linji moved to the Linji temple in Hebei, where he took his name, which also became the name for the lineage of his form of Chán Buddhism. The Hongzhou school developed "shock techniques such as shouting, beating, and using irrational retorts to startle their students into realization". Some of these are common today, while others are found mostly in anecdotes. It is common in many Chán traditions today for Chán teachers to have a stick with them during formal ceremonies which is a symbol of authority and which can be also used to strike on the table during a talk. ... the idea of "becoming a Buddha" by means of any practice, lowered to the standing of a "means" to achieve an "end". The criticism of seated dhyana reflects a change in the role and position of monks in Tang society, who "undertook only pious works, reciting sacred texts and remaining seated in dhyana". Nevertheless, seated dhyana remained an important part of the Chán tradition, also due to the influence of Guifeng Zongmi, who tried to balance dhyana and insight. From the "question-and-answer format that had been developed as a means of conveying Buddhist teachins" developed the "yü-lü" genre, the recorded sayings of the masters, and the encounter dialogues. The best-known example is the "Lin-ji yü-lü". [web 1] It is part of the Ssu-chia yü lu (Jp. Shike Goruku, The Collection of the Four Houses), which contains the recorded sayings of Mazu Daoyi, Baizhang Huaihai, Huangbo Xiyun and Linji Yixuan. These recorded sayings are not verbatim recordings of the sayings of the masters, but well-edited texts, written down up to 160 years after the supposed sayings and meetings. Mazu is perhaps the most influential teaching master in the formation of Chán Buddhism in China. When Chán became the dominant school of Buddhism during the Song Dynasty, in retrospect the later Tang Dynasty and Mazu's Hongzhou school became regarded as the "golden age" of Chan. The stories about the Hongzhou school are part of the Traditional Zen Narrative which developed in China during the Tang Dynasty and the beginning of the Song Dynasty, from the 7th to 11th century. It became dominant during the Song Dynasty, when Chán was the dominant form of Buddhism in China, due to support from the Emperial Court. The Hung-chou school has been criticised for its radical subitism. Guifeng Zongmi (圭峰 宗密) (780–841), an influential teacher-scholar and patriarch of both the Chán and the Huayan school claimed that the Hung-chou tradition believed "everything as altogether true". 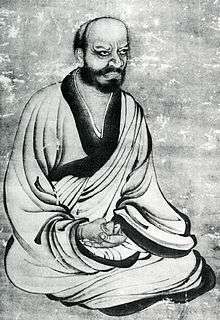 According to Zongmi, the Hung-chou school teaching led to a radical nondualism that believed that all actions, good or bad, are expressing the essential Buddha-nature, but therefore denies the need for spiritual cultivation and moral discipline. This would be a dangerously antinomian view as it eliminated all moral distinctions and validated any actions as expressions of the essence of Buddha-nature. While Zongmi acknowledged that the essence of Buddha-nature and its functioning in the day-to-day reality are but difference aspects of the same reality, he insisted that there is a difference. To avoid the dualism he saw in the Northern Line and the radical nondualism and antinomianism of the Hung-chou school, Zongmi’s paradigm preserved "an ethically critical duality within a larger ontological unity", an ontology which he claimed was lacking in Hung-chou Chan. ↑ Yampolski 2003-A, p. 11. ↑ McRae 2003, p. 82. ↑ Chang 1971, p. 148-149, 177. ↑ Chang 1971, p. 152. ↑ Dumoulin 2005-A, p. 170. ↑ Poceski 2010, p. 19. ↑ Dumoulin 2005-A, p. 171. 1 2 3 Wright & Year unknown. ↑ Kasulis 2003, pp. 28–29. 1 2 Faure 1997, p. 73. 1 2 Faure 1997, p. 74. ↑ Dumoulin 2005-A, p. 179. ↑ Schuhmacher and Woerner (editors) 1991, p. 141. ↑ McRae 2003, p. 18-21. 1 2 McRae 2003, p. 19. ↑ McRae 2003, p. 14. ↑ Gregory 2002, p. 236. ↑ Gregory 2002, p. 239.